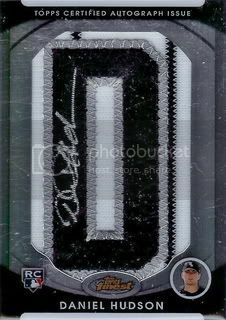 On our final day of "5 Days of Daniel Hudson" we bring to you a nice manufactured patch certified autograph. This one's from the 2010 Topps Finest set. This is the first manufactured patch auto I've ever bought. I must say these are nicer in person than I thought they would be. Maybe it's because the signature on this one isn't bad. I've seen worse. In case you were wondering, this one's numbered 78/217 on the back. I hope you enjoyed "5 Days of Daniel Hudson." Go D-Backs!